State Representative and Republican Candidate for the 11th Congressional District, Darlene Senger, announced the beginning of her districtwide listening tour today. The tour will allow Darlene to gain firsthand knowledge of the issues facing residents and municipalities within the district. 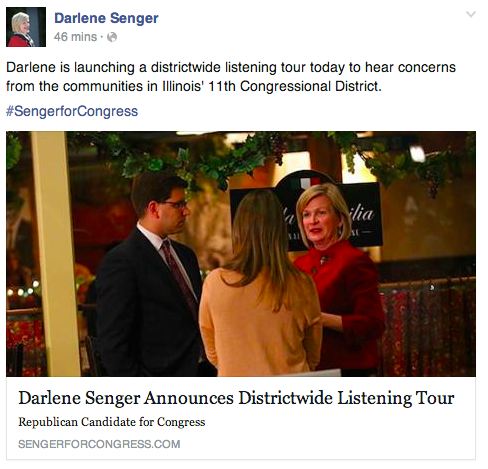 Senger’s listening tour will start in Will County and take her throughout the 11th congressional district to events in New Lenox, Joliet, Plainfield, Romeoville, Bolingbrook, Aurora, Downers Grove and Woodridge. The tour will continue in more municipalities throughout the district in upcoming weeks.